Caleb Marker is a partner at Zimmerman Reed, working out of the firm’s Los Angeles office. Caleb has dedicated a significant portion of his practice to consumer protection and employment cases, including consumers, misclassified employees, mortgage borrowers, student loan borrowers, and senior citizens. 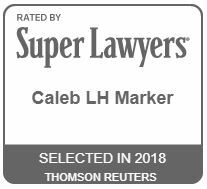 Caleb is a creative litigator who has been a leader in the consumer protection area and has been actively involved as class counsel in cases that have provided meaningful recoveries, through trial or settlement. He has first-chair trial experience in court and arbitration, having tried several cases to verdict and award. In 2016, he tried the first merits arbitration in the United States that alleged that a “gig economy” worker was an employee as opposed to an independent contractor and has continued to try and advance such cases in arbitration and courtrooms. He has briefed and argued appeals in California, Michigan, and the Ninth Circuit. In 2018, Caleb was selected as a drafter and member of the editorial board for The Bolch-Duke Conference Guidelines and Best Practices published by Duke Law School. The guidelines, drafted and edited by attorneys and state and federal judges, were recently published as “Implementing 2018 Amendments to Rule 23 – Class Action Settlement Provision (2018)” and are available for download: Executive Summary and Full Report. Caleb currently represents misclassified employees in cases in state and federal court, as well as in arbitration. In addition, Caleb represents women subjected to pay discrimination and, as a result, paid less than their male colleagues in California. Caleb also represents tobacco consumers as a member of the plaintiffs’ steering committee for In Re: Santa Fe Natural Tobacco Company Marketing and Sales Practices Litigation (MDL 2695) currently pending in the U.S. District Court for the District of New Mexico. The Santa Fe MDL was recently the subject of an in-depth article published by Bloomberg Businessweek in an article entitled “Nature’s Cancer Sticks: American Spirits Long, Strange Trip to Court.” Caleb is also currently part of the ZR team representing the multiple U.S. states in investigations and litigation against pharmaceutical manufacturers, drug distributors, and pharmacies for their roles in the ongoing opioid crisis. Caleb leads the firm’s involvement in representing a sexual assault survivor of Larry Nassar, the former Michigan State University team physician and U.S. Women’s Gymnastics Team coach. Nassar has been sentenced to up to 175 years in prison and dozens of high-ranking university and gymnastics officials have been ousted or face criminal investigations for their role in these heinous crimes. Among other issues, Caleb is defending Michigan P.A. 183 which provided a brief window for child sexual assault survivors to bring suit regardless of whether the statute of limitations had previously lapsed. In recent years, Caleb’s successes include leading a class action against the City of Los Angeles and Xerox that drew widespread media attention, winning a trial that now requires the City to end its decades-long outsourcing of the City’s parking violations bureau in a case that will help over a hundred thousand motorists in Los Angeles in the next few years. Caleb later defended the trial court’s verdict on appeal, resulting in a unanimous opinion fully affirming the trial court’s verdict and award under the private attorney general doctrine. Weiss v. City of Los Angeles, 2 Cal. App. 5th 194 (August 8, 2016). Caleb has been a driving force in a number of class actions that have resulted in eight-figure settlements, including actions that have involved misclassified employees, homeowners that have fallen victim to force-place insurance practices, patients at understaffed nursing homes, consumers of dangerous gas absorption refrigerators, and student loan borrowers who were overcharged for interest. Caleb serves on the Los Angeles County Bar’s Litigation Executive Committee and Access to Justice Committee, the latter of which aims to maximize the delivery of legal services to the poor and encourage attorneys to provide free legal services to those in need. Several of his successes have been recognized as a “Top Settlement & Verdict” by the Los Angeles Daily Journal and Michigan Lawyers Weekly. He has been interviewed by numerous media outlets, including NBC, Fox Business, NPR, The Wall Street Journal, AP, the Los Angeles Times, LA Weekly, and Law360. He has also been recognized as a Rising Star of Law in Southern California by Super Lawyers from 2015-2018, after a peer-nomination and review process awarded to less than 2.5% of attorneys under 40. A native of Michigan, Caleb graduated from Michigan State University’s James Madison College and College of Law. He is a member of the Los Angeles County Bar Association (LACBA), Duke Law’s Bolch Judicial Institute and Electronic Discovery Reference Model (EDRM), the Federal Bar Association (FBA), the American Association for Justice (AAJ), Consumer Attorneys Association of Los Angeles (CAALA), and Consumer Attorneys of California (CAOC).